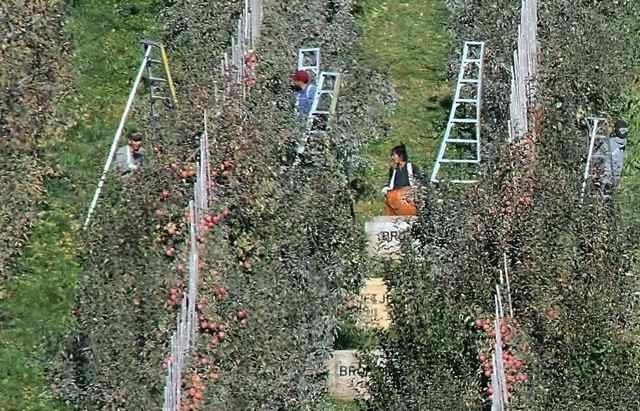 Local fruit grower Broetje Orchards faces a class-action lawsuit for how it pays field workers for picking apples and berries, among other tasks. According to the lawsuit filed Monday in Walla Walla County Superior Court, Broetje pays its employees piece-rate for the amount of produce they pick, but the company does not compensate employees for additional hours spent attending safety meetings or time lost from weather delays. The lawsuit requests that the company provide back pay to its employees, at double minimum wage, for all of the nonproductive hours they worked. Llecenia Reducindo and Santiago Medina Chipres and about 300 unnamed, current and former employees are named as plaintiffs in the case. Tacoma attorney India Lin Bodien said she and her colleagues want to make sure workers are fairly compensated for their time. Los Angeles attorneys Craig J. Ackermann and Brian Denlinger, with Ackermann & Tilajef, and independent attorney Tatiana Hernandez joined Bodien in representing employees. "We're hoping the company will do the right thing to resolve the claims, and if they don't, we are prepared to litigate and vindicate our clients' rights," Bodien said. Broetje Human Resources Director Roger Bairstow said Thursday the company did not have any comment on the case. Broetje is a 40-year-old, family-owned company with more than 6,000 acres of apple and cherry trees in Prescott, Benton City and Wallula, according to its website. This lawsuit, Bodien said, stems from a 5-4 decision by the Washington State Supreme Court on May 10. According to the decision in Carranza v. Dovex, farm workers can be paid on a piece-rate system for the hours they are actively picking fruit. But any other work, such as unloading equipment or traveling between fields, must be compensated for on an hourly basis, and agriculture laborers must be paid at least an hourly minimum wage. Since the ruling, Bodien and her colleagues have filed similar lawsuits throughout the state seeking compensation for unpaid hours, she said. Bodien is now waiting for a response to the complaint from Broetje attorneys, she said. It is just the beginning of the legal process. Bodien was an attorney involved in a lawsuit resolved in February involving Stemlit Ag Services, which paid its fieldworkers $464,000 in a settlement over unpaid rest breaks between 2014 and 2015, according to The Wenatchee World.